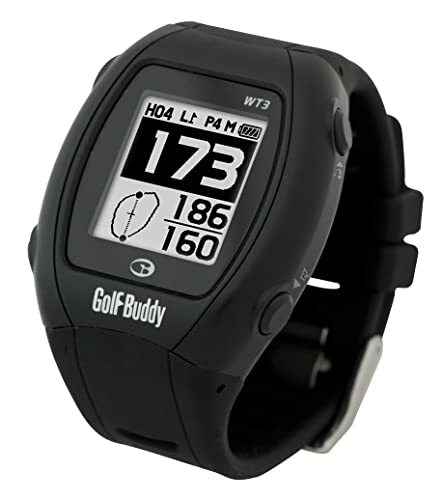 The GolfBuddy GB-WT3 Golf GPS has been around for a couple of years now. And the fact that it is still in the market even with the coming of more advanced GPS rangefinders with better features shows that it is a reliable device that will add value to your game. With an accuracy of up to 3 yards and all the essential features that you could ever need in a golf GPS. Over the years, GolfBuddy has moved to the world of smaller GPS devices and so the WT3 comes from a line of very successful products. And so I honestly only expected the best before even trying this watch. I was not disappointed starting from the silicone strap that made it enjoyable to wear and the automatic time and date setting and also the fact that in the time mode the device showed both sunset and sunrise time. When it came to the features and accuracy, I had nothing to complain about. With an accuracy of up to 3 yards and all the essential features that you could ever need in a best golf GPS Watch, I was more than satisfied with the WT3. Overall this device performed just as I had thought and wished for. This is especially so given the fact that I did not spend much on it. Preloaded Courses: This GPS stores information from more than 36,000 courses from across the world, and there is also an option to update and upgrade the information. Dynamic Green View: The dynamic green view is possible from any angle that you come in from and this is very beneficial for players. Digital Scorecard: Lets you record your scores for later review or to compare with friends and playmates. Distance Measurement: Can accurately measure the distance to the back, center and front of the green. GPS tracking: GPS tracking feature will be beneficial to a player both on and off the field and it makes it possible to use the watch for different things other than golfing. 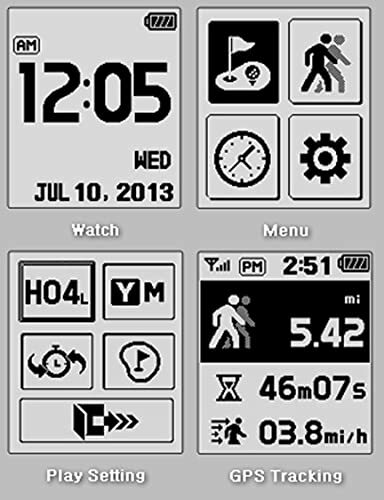 Watch Features: It can be used as a standard watch as it has all the basic watch functions such as time and alarm. Battery: The rechargeable battery can last up to 8 hours in the GPS mode and up to 50 days when the device is being used as a standard watch. Pin Placement: This feature helps you locate the direction of the pin even without seeing it and hence making sure you get better and accurate shots. Hazard and Target information: The WT3 has been designed to give clear target and hazard information and hence making it a very useful device on the course. The primary benefit that you will get from using this GPS from GolfBuddy is accuracy. It is accurate to within 3 yards, and although there are other devices with better accuracy, you will not find anything better than this at the same price range. Another benefit is that the screen is very easy to read, and so you will never have to waste any precious time on the course trying to get the readings. The watch is waterproof and rated IPX7, and this means that it can take splashes of water, rain and even immersion in water for about three minutes, but the water levels should be less than 30 feet. This is a significant merit as it means you can use the watch under severe weather conditions. The display is clear and easy to read meaning that with the WT3 you will never have to guess anything since everything is clearly visible. The watch is a plug and play as there is no programming or syncing required. Automatically resets to the main screen hence meaning that you do not have to keep wasting time pressing buttons to reset after every measurement. Compared to other GPS devices it is very affordable. This is despite the fact that it comes from one of the moat reputable companies in the industry. The rubber band is quite sweaty, and this can make it uncomfortable to play with in hot conditions. However, you can easily fix this by changing the strap. It’s a little bulky on the hand as it is quite a big GPS watch when compared to modern slim and stylish ones. Does not come with a color display screen, and this may make it look outdated to some golfers. The GolfBuddy GB-WT3 Golf GPS has been around for a couple of years now. And the fact that it is still in the market even with the coming of more advanced GPS rangefinders with better features shows that it is a reliable device that will add value to your game. If you are a golfer looking for a wearable GPS watch that has all the necessary features required, then the WT3 is a highly recommended device. The WT3 is very straightforward to use, and it will also not cost you much to buy and hence it’s worth trying out for both pro and armature golfers.